Designer Cheryl Kees Clendenon did just that for owners of a getaway home in Perdido Key, Fl, a barrier island community at the tip of the panhandle near Pensacola. 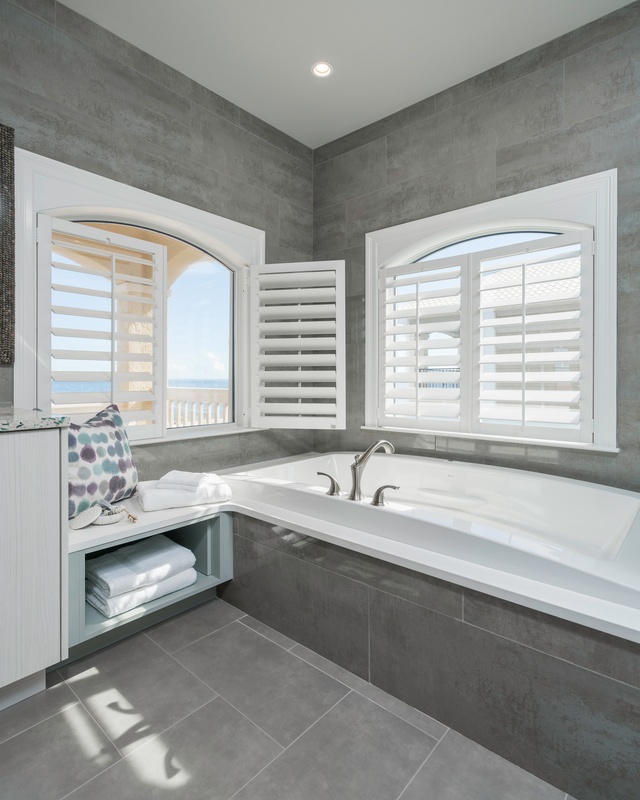 Sea breezes and natural light flow through existing windows now highlighted by cool grey porcelain tiles. More storage, better layout and the ability to age into the space were some of the clients' requests for this master bathroom project. The challenge for Clendenon was to achieve those goals while keeping focus on her overarching objective: Revitalize the space with a fresh and environment-appropriate palette, and inject a punch of character, while maintaining keen attention to existing elements. It was a design directive that could only be achieved by the most detail oriented of professionals. (Maybe that’s why her firm is called In Detail Interiors). 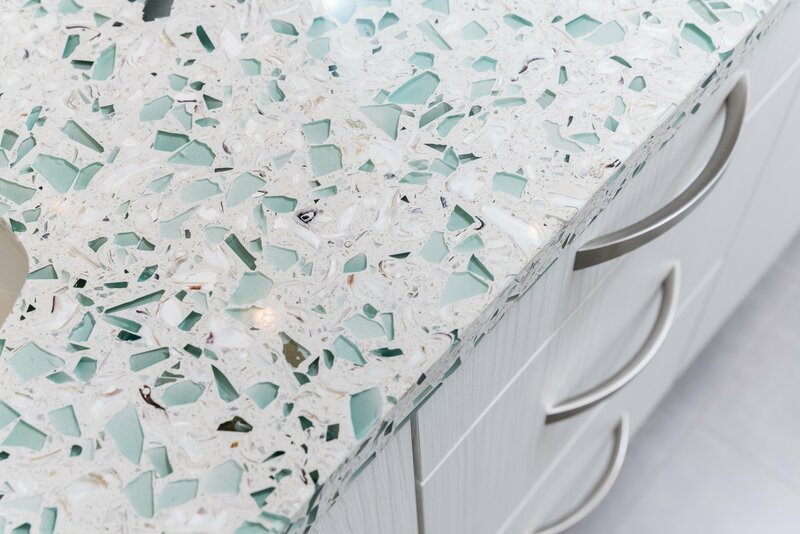 Clendenon started her design with the vanity top selecting Vetrazzo’s Emerald Coast recycled glass countertop for that fresh and environment-appropriate palette (and the punch of character). Made with bits of American marble from Georgia, pieces of South Carolina oyster shells and chunks of recycled glass from architectural windows. Samples are free to the trade. 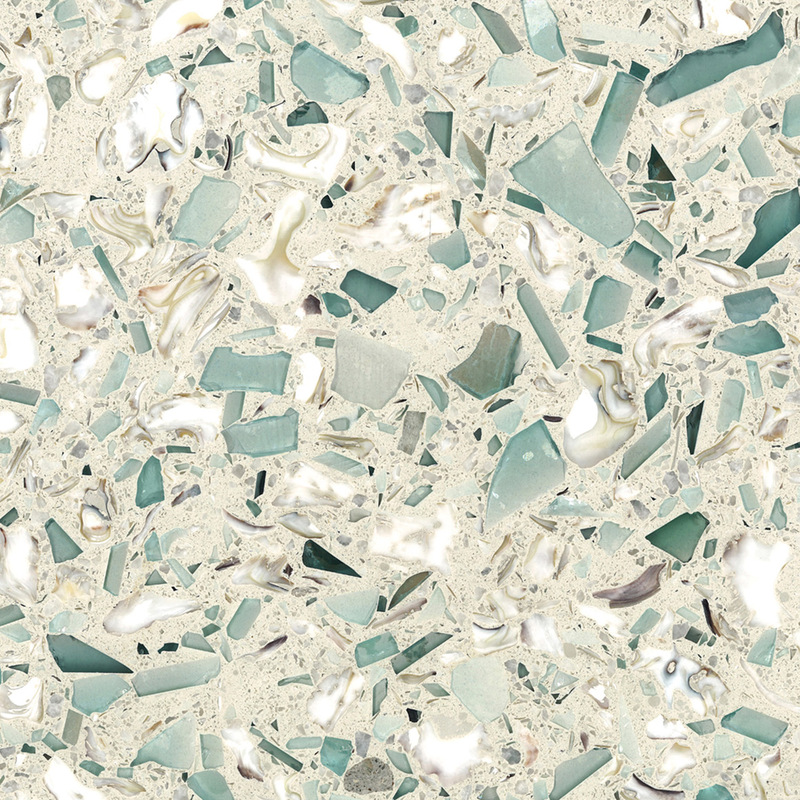 If you’re in the trade, contact UMI, Florida’s exclusive Vetrazzo distributor to get a free sample. Homeowners click here to purchase a sample. 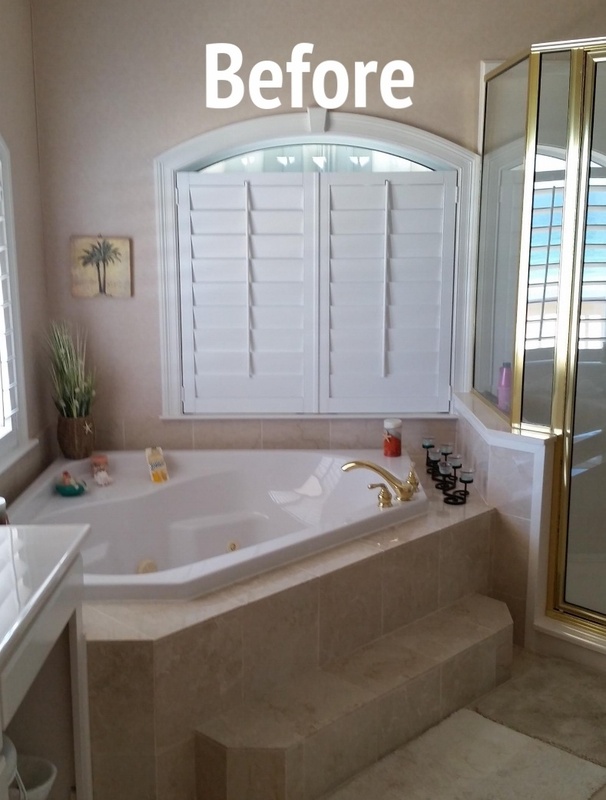 Clendenon worked to make the space safer by removing a step to the tub and adding a sitting ledge. In Detail significantly expanded the shower footprint and visually opened the space with a glass enclosure. 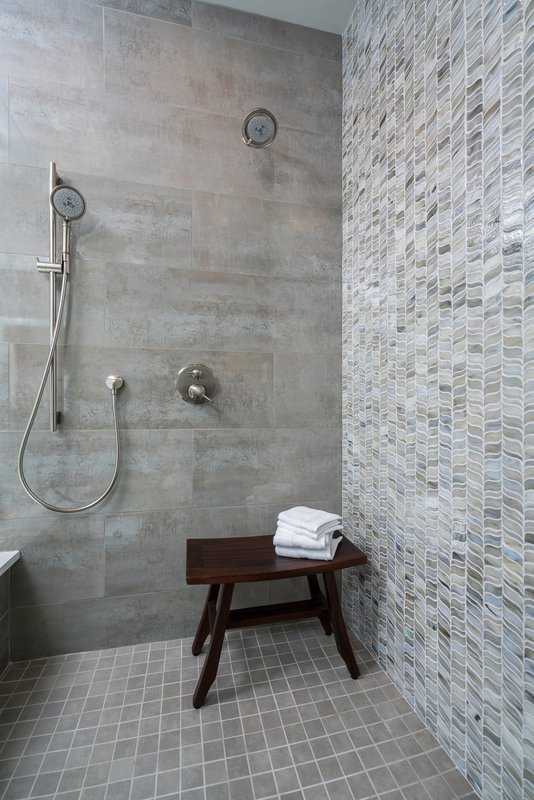 Tiled walls that wrap the room in color and soft texture transition to a mosaic accent in the shower. Fixture by Hansgrohe. Tile by Porcelanosa. LOOKING FOR A TRADE PROFESSIONAL IN YOUR AREA? 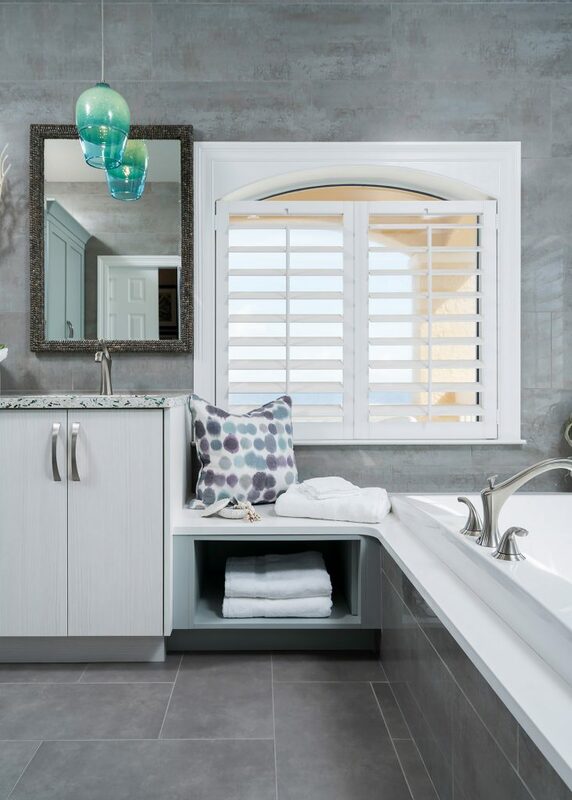 Contact UMI, Florida's exclusive Vetrazzo distributor. The UMI team can guide you to a certified Vetrazzo fabricator. Click here to speak to a UMI rep.
Mirrors by Made Goods. 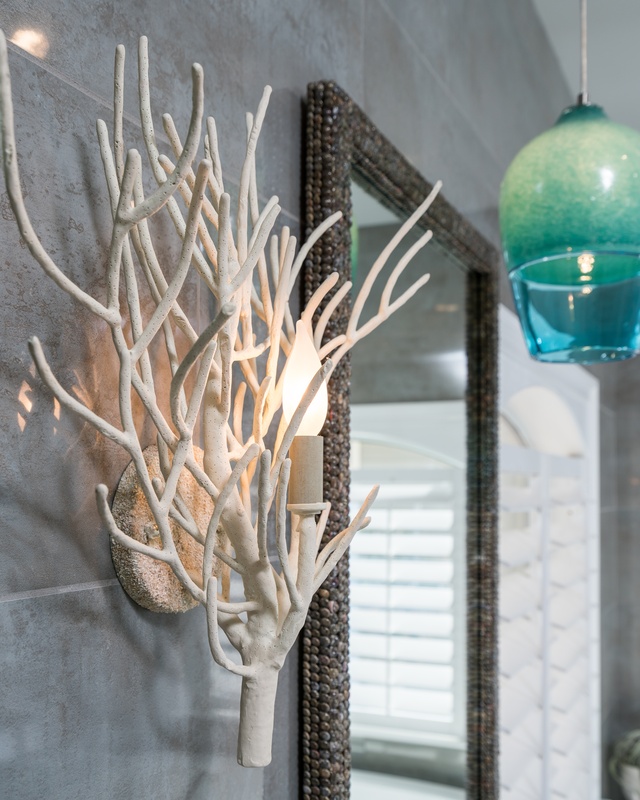 Currey sconce and Viz glass pendants available at 1514 Home. The sink cut outs reveal the contents of the Emerald Coast countertop, bits of American marble from Georgia, pieces of South Carolina oyster shells and chunks of recycled glass from architectural windows. Custom cabinetry by Paulk Woodworking was made with textured wood for a tactile experience. "We have nothing but successful results with Vetrazzo," Clendenon said. "Our fabricator Solid Design is excellent!" In Detail selected the combination of lighting to offer more original overall elevation and ample light for the client. Countertop material sourced from UMI, Florida's exclusive Vetrazzo distributor. 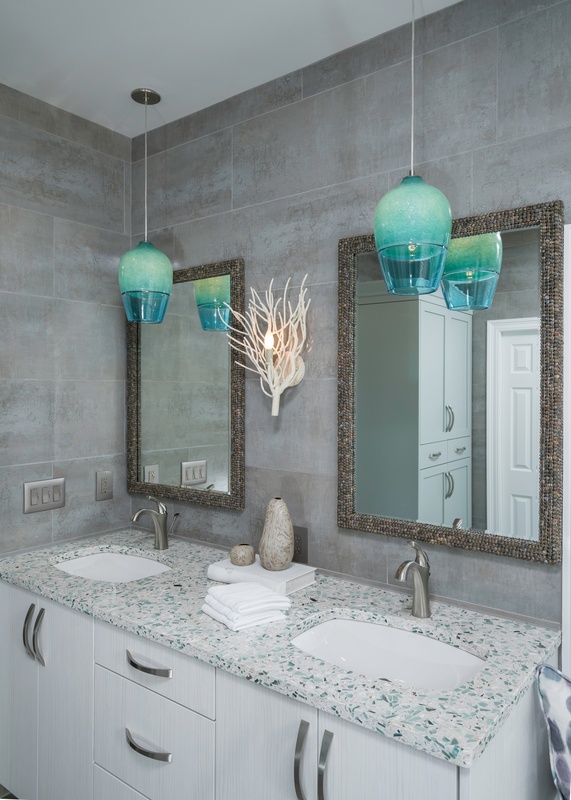 To visually connect the bathroom to an adjacent walk-in closet, Clendenon used the same Emerald Coast recycled glass to the top of cabinetry. The two spaces flow together nicely now, she said. Keep that swell of good design coming. Download the Coastal Luxe Lookbook for more coastal inspiration.